Participants are responsible for making their own travel arrangements. Please consult the following list of questions if you need any help with your travel plans. International Travel House Limited (an associate travel company of ITC) is the single agent we have appointed for all those who want to book accommodation for the OWC 2017. They can provide accommodation ranging from $15 upwards (+taxes) per person. Bulk accommodation is in the $20-25 category (per person with taxes). Use the contact information below if you wish to reserve accommodation with International Travel House. How do I get to New Delhi? New Delhi has an international airport (Indira Gandhi International Airport). For more information, please visit: Delhi Airport. Find information about transport to and from the airport here. (*Note: Some hotels may arrange transport to and from the airport.) For those travellers coming from other areas in India or from nearby countries, it may also be possible to travel to New Delhi by train or bus. What public transport is available in New Delhi? There are four main modes of transportation in New Delhi: metro, bus, auto rickshaw and taxi. For more information on public transport in New Delhi, please visit: Local Transportation in Delhi. A New Delhi metro map can be found here. The India Exposition Mart Ltd. is in Greater Noida, about an hour drive from central Delhi. You can take the metro blue line (towards Noida City Centre) to Botanical Garden and from there you can get private transport to the venue. For more information on how to get to the venue, please visit the India Exposition Mart's transport facilities page. Click here to see the venue location on Google maps. Do I need any vaccinations before travelling to India? Well before travelling to India, consult your doctor and make sure all your routine vaccines are up to date. There are also a number of other vaccines that are recommended. For more information, please visit: Health Information for Travellers to India. *Note: anyone coming from countries that have a high risk of yellow fever will be required to prove that they have been vaccinated before being allowed to enter India. For more information on yellow fever, please click here. What health and safety precautions should I take? Travellers should take care regarding health and safety. You can find tips about health and safety in India here, as well as some more specific tips for New Delhi and precautions women should take here. OWC volunteers will be at the exit gates of the Indira Gandhi International Airport to meet you on your arrival, to welcome you to the country and make you feel at home. Please ensure you provide your arrival time to us at owcdelhi@gmail.com and to myofai@gmail.com. The volunteers will ensure you are assisted to travel to your accommodation at New Delhi or Ghaziabad for pre-conferences or Greater Noida for the OWC, as required. Airport assistance will be available from November 5, 2017 till November 9, 2017. Everyone requires a visa to travel to India (except for citizens of Nepal and Bhutan). So, make sure to get all the documentation you need before travelling. In most cases a tourist visa will be sufficient to enter the country, and provides the simplest procedure. In general, everyone with an ordinary passport will require a visa to visit India. Only citizens of Bhutan, Nepal and Maldives may be exempt from the visa requirement. For more information, please read Visa Policy of India / Visa Services or visit: Indian Visa Online. If you have any further questions, please consult your local Indian Embassy. You can tick any of the options given (tourist, casual business) on the website since foreigners can visit India for either of these purposes and you will be doing both. This is the easiest, cheapest and quickest visa route. The visa rate for most cases is $48 and for a few countries $60. 2) The government of India has also facilitated the granting of a visa for the OWC for those who may need a record back home that they are attending an international conference. For this, please go to the site provided by the Ministry of Home Affairs ( https://indianvisaonline.gov.in) and complete the application on-line for a conference visa. If you need a letter of invitation, please let us know at myofai@gmail.com and it will reach you within 24 hours. Remember to mention your name as it appears in the passport, together with the passport number, so these can be mentioned in the invitation letter. The process time varies for each application. You can find general information about India visa processing times here. Information regarding Indian visa applications can be found here.To find a Indian Embassy/Mission near you, please visit: Indian Missions Abroad. The foreign participant should submit online application for conference Visa at www.indianvisaonline.gov.in immediately. 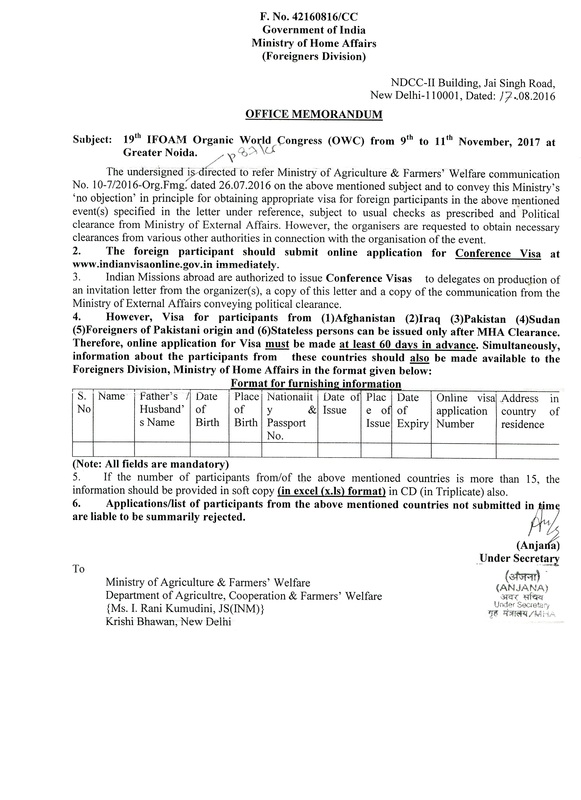 Indian Missions abroad are authorized to issue Conference Visas to delegates on production of an invitation letter from the organiser, a copy of no objection letter from Ministry of Home Affairs (Foreigners Division) and a copy of the communication from the Ministry of External Affairs conveying political clearance. However, visa for participants from (1) Afghanistan (2) Iraq (3) Pakistan (4) Sudan (5) Foreigners of Pakistani origin (6) Stateless person can be issued only after MHA Clearance. If the number of participants from/of the above mentioned countries is more than 15, the information should be provided in soft copy (in excel (x.ls) format) in CD (in Triplicate) also. Applicants / list of participants from the above mentioned countries not submitted in time are liable to be summarily rejected. Please click here to download the no objection letter from the Ministry of Home Affairs (Foreigners Division). Participants are responsible for their accommodation during their stay. Please find below a list of information to help you with your choice. Please use, as far as possible, the official travel agent who is known to the organisers and very reliable. Their hotel rates commence from 15$ upwards per person per night and the accommodation is mostly in Greater Noida. The venue is located in Greater Noida (about an hour drive from central Delhi). You can find a list of hotels recommended by the India Exposition Mart here. Alternatively, here are some websites that are useful for booking accommodation, however, please read the reviews carefully before making your choice: Booking.com, Agoda, Airbnb. *Note: Be sure to book well in advance to avoid disappointment. What is the average price for accommodation? Accommodation prices vary according to your preferences and budget. By checking your arrival and departure dates on Booking.com, you can get a good idea of the prices you can expect to pay. Travellers can find cheaper/budget hotels or hostels in Paharganj or Karol Bagh, however, these areas are overcrowded which can be overwhelming for some visitors. For organic farmers from Asia (including India), Africa and Latin America, OFAI is pre-booking special condos in the Greater Noida area on multiple share basis, which may bring the price down to $10-$15 per person per day. For this, please book your requirement with owcdelhi@gmail.com in advance. Tell us how many people you want accommodation for, and we shall reserve it for you. Pay on arrival. First come, first served. All pre-conferences are being held in New Delhi city except for the International Organic Livestock Conference which will be held in Ghaziabad, which is home to the National Centre of Organic Farming (NCOF). Please note the pre-conferences are not being held in Greater Noida. The Seeds Conference, the TIPI workshop and the Organic Food Systems meeting are being held in one common venue: the Constitution Club of India, located on Rafi Marg, very close to Parliament on 8 November, 2017. This location is accessible through the Delhi Metro (Central Secretariat Metro Station, Exit Gate 3 on the Yellow Line and also from Patel Chowk Metro Station, Exit Gate 2 on the same Yellow Line). The venue is 7-10 mins walk from both the metro stations. Those attending pre-conferences are therefore advised to book a day's accommodation in New Delhi, through the official travel agent. Vishwa Yuvak Kendra (International Youth Center), also referred to as VYK, has 114 seats in AC dormitories and 35 well furnished double rooms. Please check the website for pictures and online booking- http://www.vykonline.org/hostel-facilities.html. Apart from the air-conditioned rooms available in the VYK, there are quite a few other options around Constitution Club of India (CCI). The INOFO GA will be held in the Indian Social Institute (ISI), behind the Sai Baba Temple, off Lodi Road. ISI has modest accommodation upto 98 rooms on twin sharing basis. It is generally used by social activists. It is therefore recommended that participants move to their Greater Noida accommodation after the pre-conferences on the evening of November 8. (If, however, they are booked in accommodation throughout in Greater Noida, they can still share travel to Delhi city or Ghaziabad for the pre-conferences. If they share taxis (app based cab service like Ola, Uber can be ordered through our volunteers), costs will be quite reasonable. Distance time is approximately 60-90 mins. They can also board the Delhi metro at Botanical Gardens (direction: Noida City Center) on the Blue line, 45 mins from the OWC venue. The Global Organic Textile Standard (GOTS) pre-conference is being held at the India Habitat Centre, almost adjacent to the Indian Social Institute, on November 8. OWC managers will make special buses available for transfer of all participants from the 3 pre-conferences at Constitution Club to Greater Noida in the evening after the pre-conferences end. Rooms have been pre-booked at the International Youth Centre (Vishwa Yuvak Kendra) which has double rooms + 60 dormitory beds (all AC) for IFOAM members attending the GA. The OWC managers will make arrangements for bulk transport from the OWC venue to the Vishwa Yuvak Kendra for this purpose on November 11 evening after the Motions Bazaar. The GA on 12 November 2017 will be held at the Constitution Club of India. The GA will be continued at the Vishwa Yuvak Kendra on 13 November 2017, from where members can go either to airports or to railway stations for post-OWC farm visits. IFOAM Members attending the GA can reserve a space in their user area after completing their registration. Please note, rooms are available on a first come, first serve basis. OWC hosts are making arrangements for your breakfast, lunch and dinner on the first day at the venue. These are included in the registration fees you pay for the OWC. (You are of course free to have breakfast or dinner at places outside the venue.) Therefore, there is no need to pay for a B&B. You need only pay for the room. We are serving simple but delicious Indian breakfasts at the venue in order to ensure you are there on time. If you wait to have breakfast at your hotel, chances are you will miss the plenary sessions which commence first thing in the morning. We also want to ensure that the plenary speakers do have a good audience.